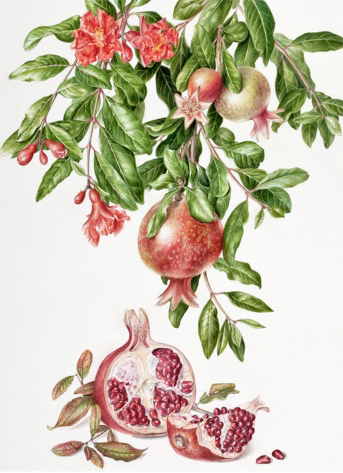 Watercolor painting by Akiko Enokido, Pomegranate, Punica granatum, © 2010, all rights reserved. An article in the April 2011 issue of American Art Collector features the upcoming exhibition, Green Currency: Plants in the Economy to be held at the New York Botanical Garden April 30 – July 31, with images of Akiko’s Pomegranate, Punica granatum; along with milly acharya’s Foxglove, Digitalis purpurea/D. lutea, and Karen Kluglein’s Corn, Zea mays. The exhibit is organized and hosted by The New York Botanical Garden and curated by the American Society of Botanical Artists, and features 43 artworks of plants used for medicine, food, clothing, fuel, and shelter. Participating artists are from the US, Australia, Brazil, Canada, Italy, Japan, and the UK. Art Collector 66001 Click the link to download the PDF and read the article and see the images. Congratulations Akiko and all of the participating artists. For updates on the exhibition visit http://www.asbagreencurrency.blogspot.com. After the exhibit opens new artwork will be posted to the blogsite every few days. Subscribe to the blog to receive notices and artwork by email. Great job Akiko. I saw this painting at the Chapman Exhibition and fell in love with it immediately. You got the opened pomegranate done beautifully. It looks ready to eat!